Home Mammals Carnivorous Mammals Do Raccoons Hibernate or Not? Raccoons are highly adaptable mammals, capable of eating a wide variety of foodstuff in different seasons. Due to their restless nature, they are active all year round except for the fact that they often go into a ‘sleep-like’ state (known as Torpor) in severe winter. However, this behavior cannot be called as truly hibernation but it is similar to it. That being said, when raccoons come out of this hibernation-like state, they tend to lose 15 to 50 percent of their weight due to lack of food. Now most people often wonder do raccoons hibernate in the winter, just like other animals? Well, to put it simply: No, they do not. Do Raccoons Hibernate in the Winter? Normally, these mammals do sleep for long periods of time in low temperature. However, they are often found to stay active throughout the year. As winter approaches some of the northern areas like Canada, it is so severe that it compels most wild animals to go into hibernation. Likewise, raccoons also prefer staying in their dens during these intense cold days of the north. They are found to snuggle down in their dens, slowing down the metabolism and conserve as much energy as possible. In order to survive these unpleasantly rough days of winter, raccoons may sleep in their dens for extended periods that may last for up to a month. Learn more: When Do Raccoons Have Babies? Despite the fact that raccoons often hunker down as soon as the winter sets in, this does not mean they’re hibernating. Even though raccoons spend most of the winter time in their dens, they still occasionally come out to check weather conditions. These wild animals are most active in fall and summer as they often make their way into gardens and homes. As a result, they pose some serious problems for humans because they seek out food everywhere and eat almost anything they find. Raccoons are efficient hunters and are mainly active during the night. In summer, they may not be seen hanging around in cities or towns. But the severity of cold often bring them close to yards, homes or other urban settlements. Learn more: Can Raccoons Climb Trees and Fences? In cities, they may rummage through garbage cans in search of food. They may continue to eat as much as they can especially at the end of the year in order to store it as fat for winter. They eat a lot of food during spring or summer seasons. This way, the food gets accumulated in the form of thick fat layer over the animal’s body. 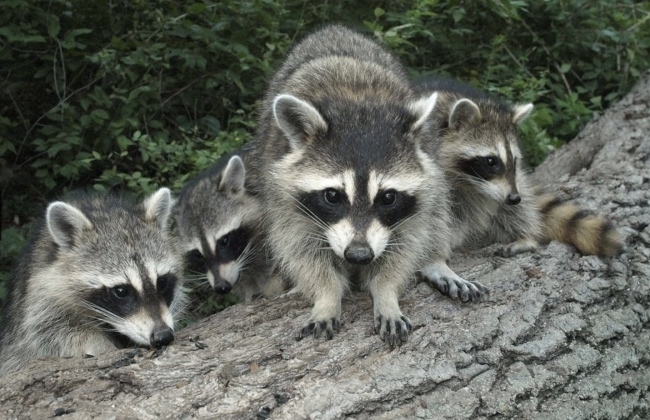 Consequently, raccoons remain out of harm’s way thanks to a thick winter coat, which insulates them from severe cold. Most of the fat is stored inside the tail of raccoons which is why they often curl up in their dens to avoid cold. As compare to warmer days, the winter coat gets thicker in extreme cold due to extra intake of food. This thick coat layer prevents the body heat to escape and makes sure that it is trapped inside. Even though raccoons do not hibernate in the usual manner like other animals, yet they certainly go into deep sleep known as Carnivorean Lethargy. In hibernation, animals do not wake up as long as the winter exists. But what’s unusual about raccoons is that they often come out even in the coldest months and see whether the temperature is still cold enough or not. Learn more: Are Raccoons Nocturnal? As raccoons wake up, they resume their search for food with great effort and probably also seek shelter that would be warm enough for them to stay. For that reason, these animals can become a nuisance even in winter. During winter, if the den becomes too cold to live, raccoon may instead come out and search for any other warmer place. As a result, you’d probably have witnessed these backyard buddies making their way into the attic through making holes from the rooftops. Besides, harsh winter means there is no food, which in turn, makes raccoon hungry (or crazy) enough to do a great deal of damage to property. Therefore, you cannot just sit and relax even in the coldest days thinking as if this animal may not force its way to your home.